Kindergarten student Levi is walking into Mapleview Elementary School in Dunnville for the first time, and his eyes are like saucers. He’s looking at the shiny floors, the new coat hooks, the large,expansive windows with light flowing in. Every few seconds, a new detail catches his attention. “I like the gym the best because the balls won’t get stuck in the ceiling anymore,” he says. 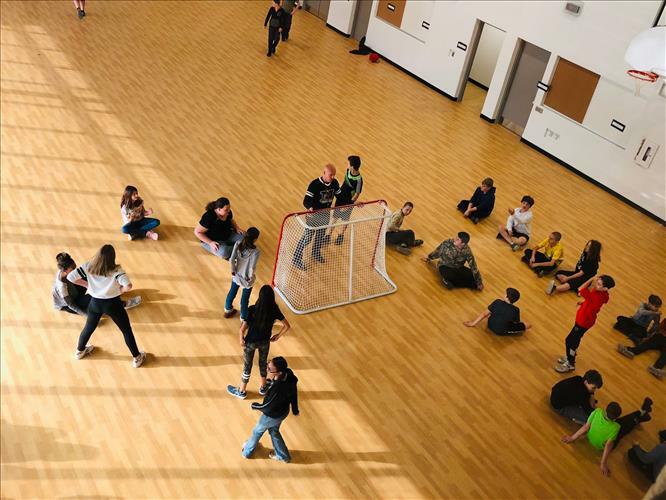 The ceiling of the gym at Fairview Avenue Public School, which accommodated students while they awaited the completion of construction of Grand Erie’s newest school, was known for not always returning balls. There’s plenty of space to throw a ball in the new gym at Mapleview – 1,515 square feet more than there was at Fairview, to be exact. 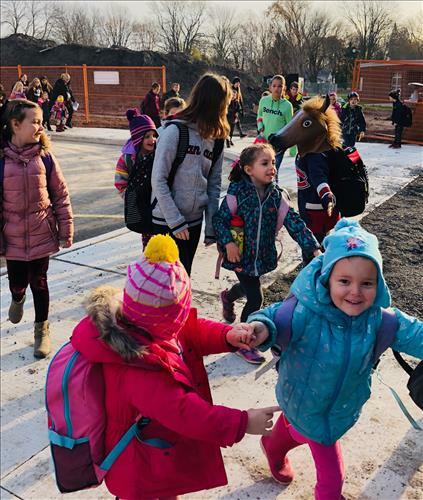 And that’s not all that’s noteworthy about the new 45,230-sqaure-foot building, which brings together students and staff from both Fairview Avenue and Grandview Central Public School. Monday, November 12 was a day of positive first impressions as classes officially began in the new school. Joining Oldham in welcoming students were senior administrators including Director of Education Brenda Blancher, Superintendents Raf Wyszynski and Wayne Baker, Trustees James Richardson, Rita Collver, David Dean, Carol Ann Sloat and Chair Greg Anderson. The overall design follows guidelines within the Board’s Green School policy, with daylight sensors to reduce electrical consumption, occupancy sensors for rooms, highly efficient boilers and ventilation systems, reflective roof to reduce solar heat gain, low VOC materials and finishes, and maximized recycled content in products and materials. The project is the result of the Haldimand East Pupil Accommodation Review, and is funded through a Capital Priorities grant of approximately $10 million from the Ministry of Education. It features 14 regular classrooms, three Kindergarten rooms, a Special Education room including a Snoezelen Room, an Early Years centre, and Learning Commons with a media room. The double gym includes a separate outside entrance to encourage community use. The parking lot was planned with a bus loop and drop-off area to alleviate congestion on the street. There’s an elevator, and the whole building is accessible. Students played a big part in getting ready for the move. Together, they chose Mapleview’s team name (the Mustangs), named their new mascot (Mighty Mustang), and helped fill approximately 900 boxes that came with them to the new building. Morphet says students have enjoyed monitoring the progress from their vantage at Fairview over the last year as the building took shape. 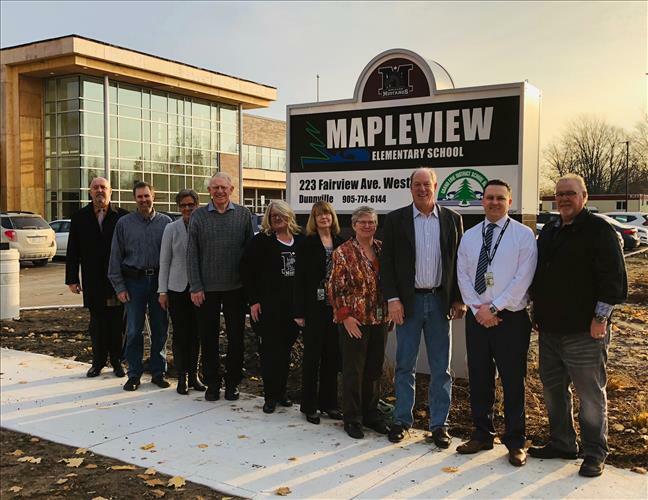 The construction of Mapleview reflects Grand Erie’s Multi-Year Plan and its Environment indicator, making sure the site boasted learning spaces that reflect current teaching and learning needs, as well as improving energy and conservation. The staff already know how to build cultures of care and respect, so now they’ll be recreating that welcoming environment in their new digs.